This elegant bedroom piece is a wonderful choice for a master suite. Each piece is handcrafted using the finest hardwoods that are hand-rubbed to give a lush Antique finish. 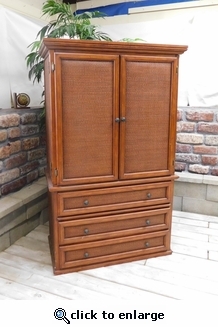 Drawer front and side panels are made of padded handwoven natural wicker. This combination of hardwoods and handwoven wicker make this one of our finest pieces.